Finding the winner of the Grand National is often likened to finding the numbers you need to land the National Lottery. Indeed it’s surely no coincidence that the very first winner of the great race, way back in 1839, was a horse called Lottery. Forty runners, 30 fences, four-and-a-quarter miles. Where do you start? Most of us rely on names we like, or jockey’s colours we like. Many of us just stick in a pin and hope for the best. To help all the pinstickers, I’ve pieced together this mini-guide to all the runners for Saturday’s race at Aintree, which is being shown live on ITV at 5.15 pm. Removing all the technical jargon, it just gives you a bit of extra inside information on each horse, their jockey, trainer and owner that you might find useful or interesting. The horses are listed in racecard order, complete with their prices in the betting market, which were accurate at the time of writing. Good luck! PLEASE NOTE: My personal Grand National tips will now appear on this website from 12 midday on Friday. One For Arthur (left), on his way to winning the 2017 National. He is back again on Saturday. (PHOTO BY: Alan Crowhurst/Getty Images). Must shoulder top weight of 11-10, but a class act who finished fourth in the race last year and has been placed in the last two Cheltenham Gold Cups. The main flagbearer for powerhouse owner JP McManus, and the mount of one of the best Jumps jockeys in the business, Barry Geraghty. The sole representative of champion trainer Nicky Henderson, who has yet to win the National but really needs to this year if he is to catch rival Paul Nicholls in the race for the trainers’ title The 10yo was a spectacular winner at Ascot at Christmas on his first start since switching from France but, as a result, he is high in the weights. Rachael Blackmore, one of two female jockeys on Saturday aiming to become the first woman ever to ride the Grand National winner. She is on Valseur Lido. Loveable legend who is bred to win a Derby on the Flat but took last year’s National and is set to go off one of the shortest-priced favourites in the history of the race to repeat the dose on Saturday. 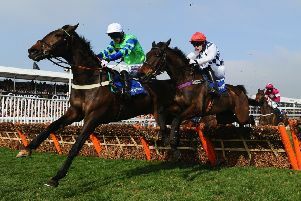 One of an elite band of horses to have won four times at the Cheltenham Festival, he is higher than ideal in the weights this year, but he’s in such fine fettle that he even bolted up in a high-class hurdle race two starts ago. Former smart chaser who has won Grade One prizes in the past and was thought good enough to contest last season’s Cheltenham Gold Cup. However, he has pulled up few trees this season and has never performed well when sent over to this country from his native Ireland. Rock The Kasbah, the mount of champion jockey Richard Johnson, who has never won the National in 20 attempts. (PHOTO BY: Alan Crowhurst/Getty Images). A former Cheltenham Festival winner and third in the Gold Cup of 2016. But he’s not won now for more than three years and his deterioration has earned him the unwanted nickname from cynics of ‘Don Slowly’. Like stablemate Outlander, he is to go up for sale at auction on the eve of the race. Interesting outsider who seems to have taken on a new lease of life since moving to the yard of Nigel Twiston-Davies, a trainer trying to become one of only eight to win the great race three times. The 10yo was electric when winning a big race at Doncaster last time, and will be ridden by the trainer’s son, Sam. Strapping Irish-trained chaser who might be 11yo but doesn’t have many miles on the clock, and will be partnered by crack Irish amateur Jamie Codd. The gelding has never really fulfilled his potential, but he will relish every drop of rain that has fallen in the Liverpool area this week because he and needs Soft or even Heavy ground to show his best. Has long been considered a Grand National type by trainer Jonjo O’Neill and extremely well handicapped on the pick of his form as runner-up in the 2017 Cheltenham Gold Cup. However, three poor runs this term suggest he’s fallen out of love with the game. Old-timer Trevor Hemmings will become the winningmost owner in the history of the race if this likeable and consistent grey follows his previous successes with Hedgehunter, Ballabriggs and Many Clouds. The 9yo would also become the second Scottish-trained winner in the last three years, and he warmed up very promisingly at the Cheltenham Festival last month. A most gallant runner-up last year when he jumped like a stag in front for the 2016 winning rider, David Mullins, nephew of the gelding’s genius of a trainer, Willie Mullins. Slightly better ground on Saturday will hold no fears, and he is the ride this time of Cheltenham Gold Cup-winning jockey, Paul Townend. However, he has shown nothing in two laboured outings so far this term. Grade One-winning hurdler who was also a high-class novice chaser last season when he was a plucky runner-up in the Scottish National. 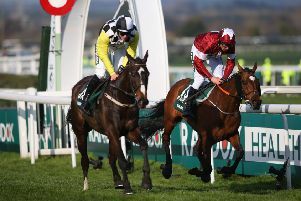 His form this term has been mixed, however, and although he was a fair sixth in the Welsh National, he fell when tackling these Aintree fences in a race in December. Unexpectedly bounced back to form last time when crack trainer Gordon Elliott immediately nominated him as an ideal type for Aintree. The worry is that he has failed to deliver in big races before, including in last year’s Irish National. But, excluding Tiger Roll, he’s the pick from five runners, owned by Gigginstown House Stud, of their retained jockey, Jack Kennedy. Willie Mullins’s classy stayer would probably be favourite if Tiger Roll wasn’t in the field, especially as he is the mount of Ruby Walsh, who is bidding to become only the seventh jockey to ride three National winners. He underlined his stamina when winning the four-miler at last year’s Cheltenham Festival and was again impressive on his winning seasonal debut in a big race in February. Victory would give Mullins a stupendous big-race double, having sent out Al Boum Photo to win last month’s Gold Cup. Brilliant come-from-behind winner of the race two years ago, but missed the following season because of injury and hasn’t looked the same force in a couple of outings this term. Trainer Lucinda Russell would be hailed a miracle worker if she gets him back to his best, but he will love the Soft ground. Solid, consistent sort who is aiming to give champion jockey Richard Johnson and seasoned trainer Philip Hobbs their first taste of National glory. A terrific jumper, the 9yo is one of few in the field who would prefer Good, dry ground. He is Johnson’s 21st mount in the race, which is a record. The only runner in the field for the UK’s best Jumps trainer, Paul Nicholls, and a game winner over the Aintree fences in December. However, all his best form has been at much shorter trips than this marathon. Dorset trainer Anthony Honeyball is said to be quite confident of a big run from this JP McManus-owned 11yo, and his CV is dotted with some taking performances. However, he will have to improve on his last effort in the race when a distant eighth in 2017. Talented 8yo who has had a busy season, mixing fences with hurdles, both in this country and in her native Ireland. It’s 68 years since a mare won the race, but trainer Jessica Harrington regards her as a National type and she did start a short-priced favourite (only to unseat her rider) for the key trial that Rathvinden won in February. Thoroughly exposed chaser who might not have the stamina for a test like this, but Gordon Elliott’s 9yo was Grade One material not so long back and caught the eye with a return-to-form effort over hurdles at the Cheltenham Festival last month. A rare ride at the highest level these days for jockey Denis O’Regan. Among the leading hopes of the battalions saddled by Gordon Elliott, he’s already a National hero, having landed the Grand National Hurdle in the USA in October. This is obviously a very different kettle of fish, but the genuine 8yo was one of last season’s leading staying novice chasers and he won well on his prep run for Aintree last month. Jockey Robbie Power has won a National for Elliott before. Sixth in the 2017 Irish National, twice an eyecatching performer at the Cheltenham Festival, this is a smart horse with a big prize in him. He’s not been easy to train, running only four times in the last three years, but he was given a quiet sighter of the Aintree fences in December and could surprise on Saturday. Dogged, staying mudlark who progressed quite well last season, although he disappointed in the Irish National. But he has offered little encouragement for his chances here in three sub-standard displays this term. Smart, progressive stayer who was a fine second in the Welsh National at Christmas and is now bidding to lift the David Pipe stable out of the doldrums. However, only one grey has won the National in the last 58 years, and you have to go back to 1940 for the last 7yo victor. Not since 1944 has a female jockey won the Grand National -- and even that was in the movies, courtesy of Elizabeth Taylor in ‘National Velvet’! But there are one or two shrewd judges who reckon Lizzie Kelly has a big chance of becoming the first in real life to do it aboard this ex-Grade One winner. The 10yo’s form might appear to have declined but that might be misleading and he is actually dangerously well-handicapped. The eccentric training operation of the Bradstocks has already produced a Cheltenham Gold Cup winner in Coneygree. Now they go for National glory with this lightly-raced 9yo whose stamina at least cannot be questioned after he ran away with the bet365 Gold Cup (formerly the Whitbread) at Sandown last April. If experience of jumping Aintree’s unique fences is anything to go by, Colin Tizzard’s 11yo is first past the post already. Four times he has tackled them and two wins have been backed by a second and a third. However, those outings were over shorter distances and his stamina for this gruelling test remains unknown. A bright future looked guaranteed for Gordon Elliott’s gelding after victory at last year’s Cheltenham Festival. But since winning on his chase debut in October, he has deteriorated alarmingly, and the National is no race for novices looking to rediscover their mojo. The loss of two horses at the Cheltenham Festival last month capped a spell of undeserved, rotten luck for owners Andrea and Graham Wylie. So no-one in racing would begrudge them National success with this useful 10yo, trained by Willie Mullins. Almost certain to stay, he’s not without a squeak either and looked poised to win a big handicap at the Festival until a bad blunder three out. Wildly over-priced. Almost certainly the quirkiest horse in the field, having thrown away many winning positions at the business end of races during his career, most notably at Cheltenham. He possesses stacks of ability, but has not been in the winner’s enclosure now since December 2016. The phrase ‘if at first you don’t succeed, try, try and try again’ certainly applies to David Pipe’s Aintree stalwart. He has safely negotiated the famous fences six times, including in the last three Nationals. But this 4m2f trip has consistently stretched his stamina in the big one, resulting in finishing positions of seventh, sixth and ninth. The conveyance for one of two women jockeys, with Rachael Blackmore, who enjoyed two wins at the Cheltenham Festival in March, taking the ride on another of Gigginstown House Stud’s contenders. Once considered Gold Cup material, the 10yo is now a pale shadow of his former self and was a remote eighth in the 2018 National. Yorkshire trainer Sue Smith, wife of former show-jumper Harvey, saddled 66/1 shot Aurora’s Encore to win the great race in 2013. This Trevor Hemmings-owned grey is much more strongly fancied, and there are few more game animals in the field. When all seems lost, he will keep grinding away. Gordon Elliott’s charge could be fancied on his triumph in the Irish National 12 months ago, particularly as he is re-united for the first time since then with jockey J J Slevin. But his form this term has been decidedly indifferent, and his backers will be relying on the trainer’s skill in priming horses for major handicaps. It’s not often that champion Irish trainer Willie Mullins fields a 66/1 outsider, but they are justified odds for Rich Ricci’s no-hoper who has not won over further than 2m5f since his point-to-point days and whose limitations over longer distances were exposed by a nondescript performance at the Cheltenham Festival three weeks ago. Trainer Robert Walford has long since talked up his 9yo as a Grand National type and was gutted last year when lameness ruled him out at the 11th hour. Now he gets his chance, and a healthy one it is too based on his fine win over the Aintree fences in the Becher Chase in December. Has since been fine-tuned with two prep runs over hurdles. Gary O’Brien, excellent TV presenter of Irish racing, has a share in this hardy 12yo, veteran of 49 races. He brings up the half-century with his first attempt at the National, although he has run with credit in the past in the Irish, Welsh and Midlands versions. Only one horse older than 11 has taken the spoils since 1995. Borders farmer Stuart Coltherd, who trains, and son Sam, who rides, team up for their second tilt at the National with this consistent 10yo. He got only as far as the seventh obstacle last year and didn’t seem to enjoy the Aintree fences either when well down the field in the Becher Chase there in December. At 14yo, Gordon Elliott’s outsider is comfortably the oldest horse in the field, and is more used to contesting cross-country races these days But he’s been an admirable servant over the years, tackling 62 races, including 51 over fences, and you only have to wind the Grand National clock back 12 months to see him coming home a very respectable third behind Tiger Roll. Rebecca Curtis is one of five female trainers represented in this year’s Liverpool marathon, and hopes are high that her lightly-raced 10yo can repeat his success in the Scottish National of 2018. An effective jumper, he prefers ground with ‘Good’ in the description and has sneaked into the race at the foot of the weights. Former useful, if limited, staying chaser for Paul Nicholls and has some respectable long-distance form in the book. But his record at Aintree, including in a couple of Nationals, is most undistinguished and considering the gelding is now 12 years old, it is asking a lot of his new handler, Jimmy Moffatt, to extract the improvement he needs.